The New Hampshire lease agreements bind a property owner, the “Landlord”, and a renter, the “Tenant”, to a contract that specifies the payment of rent along with other terms and conditions. The document is to be signed between the parties and a witness is not required although it is recommended. The parties will have to adhere to the State laws in accordance to Chapter 540 (Actions Against Tenants). Commercial Lease Agreement – For the use of office, retail, or industrial purposes. Primarily space for a business to operate. Lease with Option to Purchase Agreement – Standard contract for habitable dwelling with a provision added for the buying of the premises. Month to Month Lease Agreement (RSA 540:2) – All tenancies-at-will may be cancelled upon receipt from one party, landlord or tenant, to the other in the amount of thirty (30) days prior to the next payment date. Rental Application – Provided by the landlord to the tenant in order to obtain their financial and personal information to perform background, credit, and employment checks. Room Rental (Roommate) Agreement – An accord between the members of a shared living facility. Standard Residential Lease Agreement – Fixed term for any type of livable arrangement. 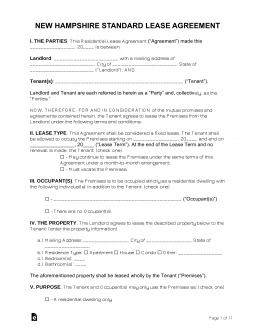 Sublease Agreement – Tenant that decides to rent their living unit to another individual (known as the ‘sub-tenant). Usually, this requires consent from the landlord/agent. Termination Lease Letter (30 Day Notice) – For the termination of a month to month rental arrangement according to RSA 540:2. A minimum of thirty (30) days is required. Lead-Based Paint – Law created by the Environmental Protection Agency (EPA) that requires all landowners to inform their tenants of this hazardous paint. Only required if the residence was constructed before 1978. Move-in Checklist (RSA 540-A:6) – Landlord must state in writing to tenant that a list of all repairs needed on the premises must be given by the tenant to landlord within five (5) days of occupancy. Security Deposit Receipt (RSA 540-A:6) – Unless the tenant makes this payment via check the landlord must give a receipt stating the amount and financial institution of where the money is being held. Landlord may access the rental unit at anytime, according to RSA 540-A:3, by providing reasonable notice to the tenant under the circumstances. Maximum (RSA 540-A:6) – Landlord may ask for up to one (1) month’s rent or $100, whichever is greater. Returning (RSA 540-A:7) – The landlord must send the deposit back to the tenant within thirty (30) days unless the tenant shared the property with the landlord. In that case the funds must be returned within twenty (20) days unless there was a written agreement stating otherwise.